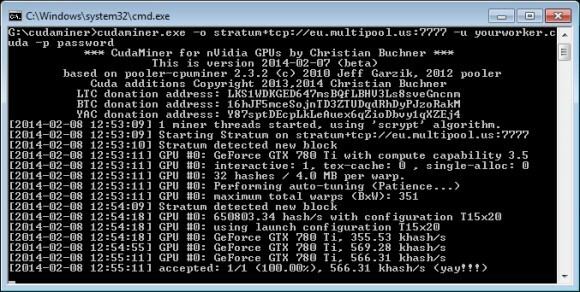 One of the best things about the CUDAminer software is that it automatically detects the best settings for your graphics card, so that after yo run it the software can squeeze out the maximum mining performance automatically for you. This takes the guesswork and a lot of time spent for testing different settings, though you can still do that if you wish to fine tune things. One of the still missing important features from this miner is the failover pool switching to backup pools in case of a problem with the current mining pool. CUDAminer already has support for scrypt mining with N=1024 (LiteCoin and many, many other scrypt clones like DOGE for example), scrypt-jane mining (Yacoin and several clones), scrypt mining with larger N (VertCoin) and the recently released MaxCoin mining (SHA-3 i.e. Keccak256). So you will be up to speed even with the latest alternative crypto currencies such as VertCoin and MaxCoin that have generated quite some buzz in the last few days. Below you can download the latest binary for windows of CudaMiner or you can compile it yourself from the (source). Update: CudaMiner is now an old and non supported anymore miner for Nvidia GPUs, you should switch to the more recent and supported ccMiner instead in order to get better support, including for newer mining algorithms and coins, as well as faster hashrates for your Nvidia-based GPU mining rigs!